Jonathan Griz came from six shots off the lead to win the Bobby Chapman Junior Invitational. When you watch Jonathan Griz play you have to wonder how good he is going to be when he grows up. The 14 year old golfer booms drives over 300 yards and keeps them out of the rough. His short game often produces chip ins from the fairway and when his putter is hot he can shoot very low scores. You don’t have to wait long because Griz is very good right now and getting better every day. The Hilton Head junior added the Bobby Chapman Junior Invitational to his collection of wins. The future Clemson golfer came from six shots off the lead in the final round to win the prestigious title by a shot. “I knew it was a long shot, but I knew I had the game to do it and I was mentally tough enough to get it done,” said the new Chapman champion. His confidence came after carding an even par first round at the event played at the Country Club of Spartanburg. “I missed a lot of putts in the first round and I knew if I could get the putter going I would have a chance to catch up,” he said. Dorman High School golfer Nathan Franks shot an opening round 67 and finished in a tie for 13th. The first round lead was shared by Joseph Pagdin from Orlando and Fred Biondi from Port St Lucie. The two Florida golfers shot 6-under par 66s to open the tournament. 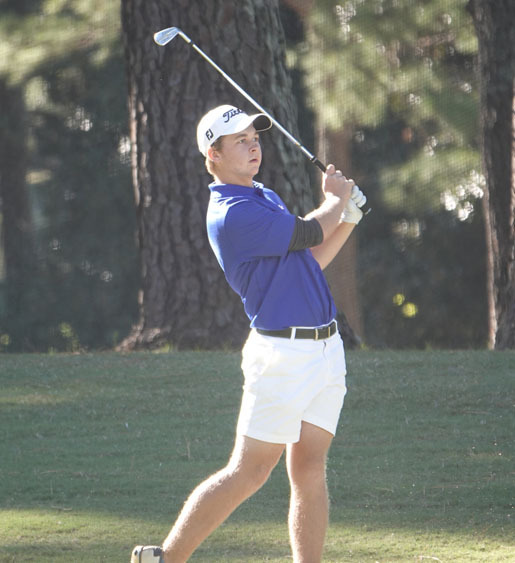 Gordon Sargent from Birmingham was one shot back and Dorman golfer Nathan Franks from Roebuck was close behind after shooting a 4-under par 67. Not only did Griz need to catch the leaders he had to get past 16 golfers who were in front of him on the leader board. The recent winner of the Orange Jacket Classic in the Upstate got off to a hot start. “I birdied the first hole, almost birdied the second hole, chipped in for a birdie on three, eagled number five and I was right there,” he said. While Griz was playing seven groups in front of the leaders, Pagdin and Biondi were not playing as well as they did in the first round. Biondi made the turn at 2-over par while Pagdin finished the first nine at even par. Griz shot a 32 on the front nine to move up to second behind Biondi. His birdie on number 11 got him to within one of the leader. Another birdie coupled with Biondi’s bogey on number 13 earned him a share of the lead and one more birdie on number 14 put him in front by a shot. “I played really good coming in. I hit fairways and didn’t hit the ball in any trouble,” he said. Griz added a birdie on number 16, just missed another birdie on number 17 and finished with a solid par on number 18. He finished his round with a tournament best 7-under par 64, but then had to wait for the rest of the field to finish. “I didn’t watch. I was on the range in case there was a playoff. You don’t want to cheer against anybody. It was nerve-racking because I really wanted to win.”said Griz. Gordon Sargent from Birmingham finished one-shot behind Griz. Sargent was the last golfer to have a chance to catch or beat Griz. The future Vanderbilt golfer made his run with four birdies in five holes on the back nine and came to the final hole even with the clubhouse leader. A par would tie and a birdie would win, but trouble off the tee cost Sargent a chance at the victory. His second shot flew the green and left him with a difficult downhill chip. Being extra careful, Sargent’s third shot stopped well short of the pin. He was left with a very fast 25 foot downhill putt for a par and the tie. His fourth shot rolled 7 feet past the pin. Sargent made the putt coming back for a bogey and second place. 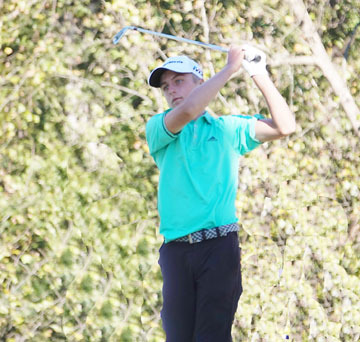 “A runner up finish here is better than the two AJGA wins I have,” said Sargent. “This is an important tournament and I played well. Last year I finished in the middle of the field so this year is better,” he said. Griz is currently the top ranked junior in South Carolina. 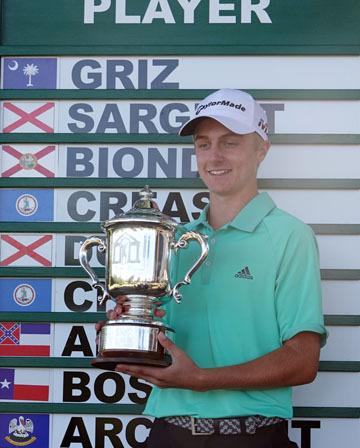 Griz has emerged as the top junior in South Carolina. In addition to the Chapman win, he set a scoring record to win the Orange Jacket at Pickens. Last summer he earned the victory at the Carolinas PGA Junior and was the top qualifier for both the US Junior Am and the Big I National Championship where he finished fifth. “It has been a really great year. This is my first national event win. I’ve been winning a lot, but not at this level. It’s great to know that all my hard work is paying off,” concluded the new Chapman champion. Dorman high school golfer Nathan Franks was the top Spartanburg area finisher. 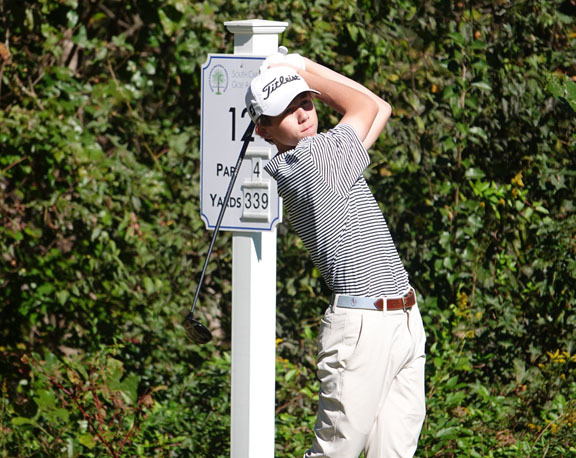 The future South Carolina golfer ended up in a tie for 13th. This was the 24th annual tournament held in honor of Bobby Chapman, a nine time Spartanburg club champion. Chapman led his families business, Inman Mills, for 30 years. He also served as the president of both the South Carolina Golf Association and the Carolina Golf Association. 2009 US Open Champion Lucas Glover was the first winner of the championship. Bubba Watson, Kevin Kisner, Brian Harmon, Wesley Bryan, Ben Martin, Scott Brown, Bill Haas, D.J. Trahan and Chapman board member William McGirt played in the tournament and went on to win on the PGA Tour. Golfweek’s top ranked teacher, Butch Harmon, joined tournament chairman Doug Smith and PGA Tour golfer William McGirt to speak to the golfers at the Players Dinner before the tournament. Golfweek’s top ranked instructor Butch Harmon gave a pre-event talk to the players and their parents at the Players Dinner. The select field of top juniors are invited based on a series of qualifications. State junior champions, US Junior and Amateur qualifiers, AJGA tournament champions and winners of recognized national junior events may apply for an invitation. This year 35 golfers in the field were ranked among the top 100 juniors in the country and 2/3 of the 91 player field have made commitments to play college golf. Proceeds from the championship are used to provide scholarships for young golfers through the Bobby Chapman Foundation.